Could this mono multifunction device popularise laser printing in the home? The Samsung Multifunction Xpress M2875FW takes a step forward for laser printers, adding several features that are common in home inkjets. Over the last few years, laser printers have come down in price until they're comfortably within the reach of the home user. But how many home users actually reached out for them? The faithful inkjet printer is still by far the most popular choice for home printing. As Mark Twain might have put it, reports of its death have been greatly exaggerated. 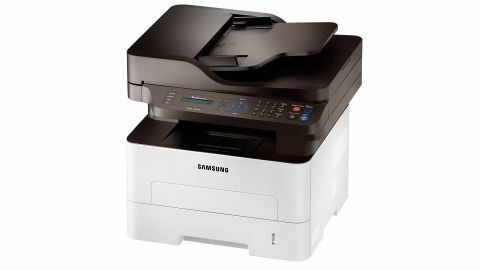 But could the Samsung Multifunction Xpress M2875FW do more to popularize the laser printer in the small and home office? Traditionally, laser printers such as the Samsung Multifunction Xpress M2875FW mono laser printer have three key advantages over inkjets. Firstly, they're cheaper to run, with a much lower cost per page than their inkjet rivals. Secondly, they're much quicker at outputting pages, and thirdly, print quality for text pages is higher than even the most capable inkjet printer. But they also have several weaknesses. Up until recently, they cost considerably more, and for photo printing, home-orientated lasers are no match for inkjets. Lasers often lack some of the features enjoyed by home inkjet printers too, such as in-built scanning and photocopying facilities, and connectivity options are less comprehensive. The Samsung Multifunction Xpress M2875FW mono laser printer could prove an exception. Although it's hardly likely to appeal to photographers, its price point, multifunction facilities and range of connectivity choices make it very attractive to those who want a straightforward, black-and-white text printer, scanner and photocopier for home or small office use. It has fax facilities too, for those who still use this ageing and out-of-favour technology. The Samsung Multifunction Xpress M2875FW can be connected to your network through Ethernet or Wi-Fi (802.11b/g/n), or directly to your computer using USB 2. It's compatible with Windows XP or later, Mac OS X 10.5 or later, Unix and various Linux distros. It also offers Wi-Fi Direct, through which you can print from your computer, tablet or smartphone without the printer being connected to your network. You simply make an ad hoc wireless connection. This is especially useful for guests, who might want to print a document or two without joining your network, and for printing from mobile devices if the printer is connected to your Mac or PC through USB. There's a smartphone app available too; Samsung Mobile Print App for iPhone, iPad, Android, and Windows Phone lets you print Microsoft Office documents as well as the usual PDFs, jpegs and plain text files. You can even scan and fax, directly from your tablet or smartphone. Paper handling is usually an area where the laser printer falls down compared to inkjets; many lasers lack the versatility of their more common rivals. Not so the Samsung Multifunction Xpress M2875FW, which can handle an impressive range of paper types and page sizes, including labels, light card, envelopes, and overhead projector transparencies. Paper of up to 220 grams per square meter (gsm) can be used, and it can handle sizes from 3 x 5 inches (file card) to 8.5 x 14 inches (legal, larger than A4). The paper tray can hold a meaty 250 sheets, but there's only one of them - don't expect a second tray for letterheads. There's a small bypass feeder, though, so if you want to print just a few pages on non-standard paper stock (such as letterheads, or an irregular weight of paper), you don't have to empty the main tray before doing so. The output tray can hold 120 sheets, and the scanner's automatic document feeder (ADF) up to 40 sheets. These figures wouldn't impress a busy office's IT manager, but they're more than good enough for a small or home office. Scanning through the ADF is one side at a time, but Duplex printing is catered for. For some reason, we couldn't get this to work on a Mac, which is a pity. In other respects, the Multifunction Xpress M2875FW caters very well for Apple users. It's even AirPrint-compatible, as well as being Google Cloud Print-ready. In terms of quality, the Samsung Multifunction Xpress M2875FW doesn't disappoint. Text output is very good, with crystal clear outlines, no bleed and excellent consistency. Perhaps it could be a little darker, but it's perfectly readable at even the lowest point sizes. As you might expect, image reproduction is less good. A print-out of a photo test card (in monochrome, of course) was a little banded. Printing a PDF flyer with a mixture of text and graphics proved more successful. The images were still tightly banded, but the text was clear, and its quality didn't suffer when printed white-on-colours either. While it's fine for diagrams and adequate for photo-illustrated leaflets and hand-outs, it's no use at all for detailed black-and-white photo prints. To be fair, the Multifunction Xpress M2875FW isn't sold as an image printer, and the results were mediocre rather than poor, but if you're planning to print graphics on anything other than internal hand-outs, this might not be the laser printer for you. As you might gather from the ' Multifunction Xpress' name, this unit is far from slow. Our 20-page text-only test document printed in just 55 seconds, an excellent speed for a home and small office laser printer. Scan quality is pretty good. We've seen sharper 300dpi scans, but the colours are bright (if maybe a little over-light) and Black areas are pure, without being speckled or washed out. It's not quite as good as a photocopier. Our test copy of a magazine cover was over-dark, but if you scan first and then print, you get better results, and its text photocopying is fine. Finally, its build quality cannot be faulted. It's robust enough to take the knocks in all but the busiest offices. The Samsung Multifunction Xpress M2875FW is a great multifunction laser printer for the home office or small office. It's far more versatile than most, and it doesn't compromise on the features that make laser printers attractive to begin with. Image quality is a drawback, but if you do a lot of text printing, and your graphical demands are slight, it could well be just what you're looking for. The Samsung Multifunction Xpress M2875FW is very versatile. Unlike many laser printers, it's multifunction, supports a wide range of paper stocks and is AirPrint- and Google Cloud Print-compatible for mobile printing. It also supports WiFi Direct, so you can print wirelessly without being connected to a network. Print quality is very good, unless you need detailed photographs. It's very fast compared to other lasers in its price bracket, and text output is excellent. It's great to see features like AirPrint and Google Cloud Print coming to lasers too. It's not great as an image printer. It's good enough for internal office handouts, but for anything more demanding, the quality isn't there. We wish it had more than one paper tray too, so you could have access to letterheads as well as standard photocopier paper, and its photocopying isn't great with anything other than text pages. The Samsung Multifunction Xpress M2875FW does much to bridge the gap between the home printer and the small office printer, but if you need to print decent quality images, it can't replace your similarly-priced inkjet. But if you mainly print text (especially in large volumes), and only occasionally need to output graphics, it could well prove ideal.